Below you can view all the homes for sale in the Plata Del Sol subdivision located in Las Vegas Nevada. Listings in Plata Del Sol are updated daily from data we receive from the Las Vegas multiple listing service. To learn more about any of these homes or to receive custom notifications when a new property is listed for sale in Plata Del Sol, give us a call at 702-323-5939. Fantastic Starter home , Numerous upgrades to this property; Ceramic flooring ,Pergo flooring ,Newly renovated Kitchen, with great appliances, Neutral paint colors.Master suite has outdoor access, enclosed patio area,Storage shed, fully enclosed backyard.Amble parking on side of house.Very well maintained home. MLS#2089715. BHHS Nevada Properties. Home also features solar panels (leased and can be removed) and home has been updated with new energy efficient windows. MLS#2087095. Keller Williams Realty SW.
Well Maintained, very clean, 3 bedroom 2 bath single story home.Laundry room, two car garage, brick fireplace, large kitchen, covered Patio MLS#2083075. Cheryl Wagner Realty. 2nd bedroom is a size of a master bedroom! ! MLS#2081381. Platinum R.E. Professionals. Stop By And Take A Look!! Happy Showing! MLS#2078820. Blue Diamond Realty LLC. Approximate living area totals 2,406 sq.ft. MLS#2077759. Precision Realty. Great Central Location With Easy Access To Shopping, Freeway And Schoools! 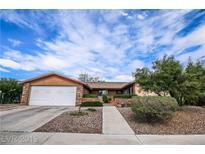 MLS#2078258. BHHS Nevada Properties. All appliances to stay. This home is must see! MLS#2076524. Elite Realty. New Stainless appliances included!Huge back yard for entertaining w/ sparkling pool, all you just need to fire up the BBQ and have fun! MLS#2074750. First Full Service Realty. 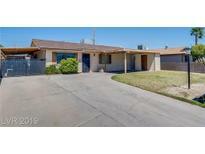 Great 3 bedroom 2 bath single story home. MLS#2068997. 24 Hour Real Estate. Home has spacious back yard with covered patio and sparkling pool. MLS#2067830. Desert Vision Realty. **everything Works, Pool Etc.. All It Needs Is Some Tender Love** MLS#2064740. Simply Vegas. *single Story Home*conveniently Located Near Dining, Shopping, Major Transportation Routes And More*carport In Front*property Is Fully Fenced*floor Plan Is Open*tile And Wood Floors*ceiling Fans Throughout*cozy Fireplace*plenty Of Cabinets And Counter Space In Kitchen*rooms Are Spacious*large Backyard With Patio*low Maintenance Landscaping Including Synthetic Grass And Palm Trees*no Hoa Is A Plus*so Much To See* MLS#2055018. Keller Williams Market Place. Take a stroll out back and create your own oasis in the desert. DONT DELAY ACT TODAY! MLS#2020573. Platinum R.E. Professionals. Come View*house Sitter In Property*lease Buyout-30 Day Move-in MLS#2017176. Turn Key Property Solutions.